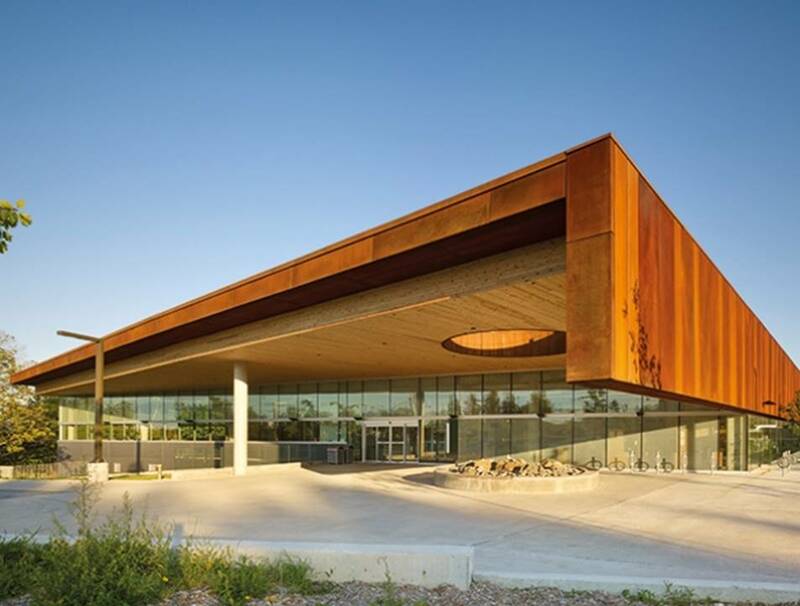 Kawartha Community Church meets on Sunday mornings at Sir Sandford Fleming College at 10:15 a.m.
We now gather in the Trades Wing on the east side of the Brealey campus main building. 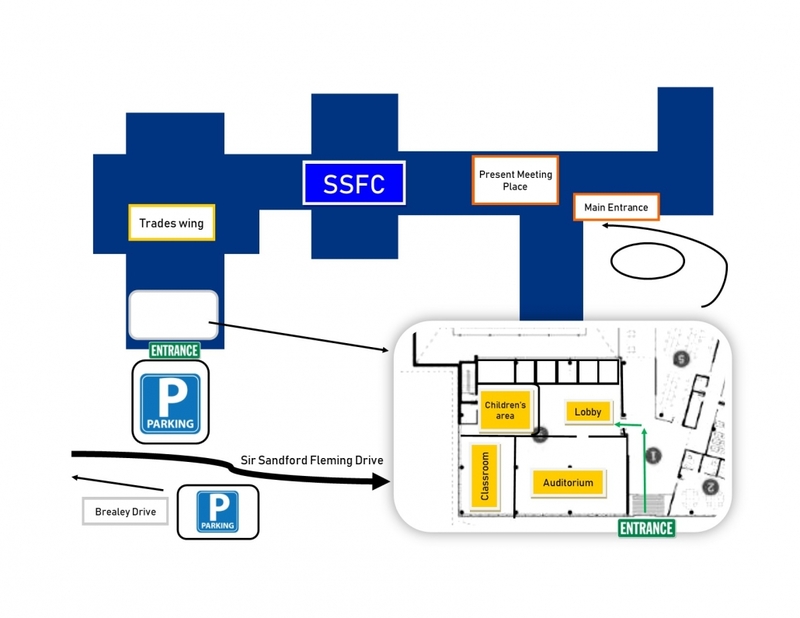 When coming from Brealey Drive, take the first parking lot on the left and come in the main doors of the Trades Wing. Follow the maps to the meeting area. Park in the lot closest to the Trades wing main entrance (facing north). We meet right inside the main doors on the left. Dress comfortably (we are not a dress up church) and bring a coffee mug. We serve Starbucks coffee. Your teens will love the services. And we offer kids programs where our staff and volunteers are trained to take care of your children. KCC was designed to be welcoming to people with little or no experience with a church background. We will never single you out or embarrass you. Come and enjoy the experience with confidence! For most of the people at KCC our community has been their introduction to faith. We invite you to join us as we learn together! Got a question? E-mail me at scott@kawarthachurch.com with any questions you have. My office number is 705-740-9056. Where in the college is the service? Park in the lot closest to the Trades wing main entrance (facing north). We meet right inside the main doors on the left. There is no cost for parking on Sundays. The gathering begins at 10:15 a.m. but if you want to come early to grab a coffee and visit, you are welcome to join us! Really you don’t need to bring anything, but if you wanted to bring a mug we serve Starbucks coffee (We have disposable cups too if you need one). Come as you are! We dress like we do during the week. There is no dress code… just maybe remember to wear clothes! Yes! KCC is a registered charity (#87256 8514 RR0001) and is affiliated with the Pentecostal Assemblies of Canada (one of the largest denominations in Canada). Our ministers are degree holders who are registered clergy recognized by the Canadian Government (But don’t hold this against us!). We have operated as a charity since 2001. A well-planned service consisting of music, a break time (where we have coffee and some goodies), videos, a message and a response time (where we do Q & A, the offering and a quote show). We usually wrap around 11:30 AM. Is the college fully accessible? Yes, we run children’s programs and have nursery care. We also run programs for Youth, Junior High and Young Adults during the week (Perhaps the best part is our services really appeal to kids and youth). We have many teens and children that pick KCC and bring their parents with them. We believe the modern and relaxed style of our church is easier for them to relate to.